Anti-Malware security is complex. Threats are constantly evolving and changing, and for those who create solutions, ensuring optimal protection can be an endless game of cat and mouse. Good anti-malware software is that which hides this underlying reality from its end user. Good anti-malware software is like a silent but vigilant sentinel, who simplifies the protection process and more or less just hums in the background. Good anti-malware software is ultimately good because it operates unobtrusively, and because you the user don’t even really know it’s there. …But what about the flashier side of anti-malware? What about accessorizing your computer with nail polish, to keep it up to date with the latest trends and the most recent malware threats? It may seem a bit ridiculous, so we’ll say it again. Nail polish. Like the kind you put on nails. It can keep your computer safe, AND it can keep it looking good. About 2 weeks ago, Wired.com released an interesting article on preventing malware infection and identity theft while traveling abroad. Their suggestion was a layer or two of sparkly nail polish, applied to the underside of your shy and homely computer. The idea behind this seemingly bizarre new approach to computer security is that it can help detect physical breaches in hardware. One of the biggest computer security threats travelers currently face when visiting foreign countries on business is physical hardware tampering. The problem is that even the best anti-malware software still cannot prevent a determined data thief with a screw driver from opening your computer and stealing your hard drive; and, in countries like China or Russia, the incentive to steal hard drives or other pieces of hardware is high. European or American business travelers and their laptops stand out in these countries like sore (unpainted) thumbs. Most of them are carrying machines that contain sensitive financial information, and none of them can guard their laptop for 24 hours a day. What’s worse, is that even those who try to remain vigilant can fall prey at border checkpoints, where corrupt law enforcement officers have been known to confiscate computers for “security purposes,” and then do what they want with them before giving them back. “What they want” usually translates to hardware theft or malware infection. To analyze changes in the night sky, astronomers take photographs of a single space over time and then monitor that space for variations. Placing two images that should be identical side by side on a computer monitor makes spotting differences quite easy. 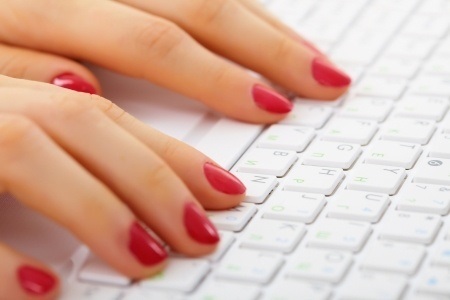 The idea with glittery nail polish, then, is to apply a layer of it over the physical entry points of your computer to create a tamper evident seal. The reason for choosing glittery nail polish is that no two coats of it are the same. The specks of glitter distribute randomly, and even if the computer were to be tampered with, and the thief somehow found a matching polish, they wouldn’t be able to replicate the glitter pattern of the original seal. Once the nail polish is applied, computer owners can simply take a photograph of the original seal. Later on if they suspect a data breach has occurred, they can either identify the breach by eye or take a photograph of what might be a new layer of polish and then compare it to the original image. Wired’s novel approach to computer security is quite ingenious. It’s cheap, effective, and like any good anti-malware solution, completely unobtrusive – that is unless you get carried away and decide to paint your entire laptop pink. The only problem with the nail polish method is that it only works to alert victims after the fact. A good anti-malware solution is one that prevents theft in the first place. Noticing that someone has tampered with your glittery seal will let you know that something malicious has occurred, and it will perhaps allow you to alert the police of the crime, but at the end of the day your data will still have been stolen. The real challenge, then, is to create an equivalent solution that enables prevention. Probably the best method, if you can afford it, is simply to buy a cheap laptop for single usage when traveling abroad. For a couple hundred dollars, a brand new machine with no sensitive data on it could save you a life time of financial duress. An added perk of buying a new and cheap machine is that even if it breaks during travel it won’t be a big deal. On top of this, there’s also the fact that if you can’t afford a cheap, disposable machine, you’re probably not worth hacking in the first place — at least from the hacker’s perspective. In the end, what Wired’s approach to computer security represents is a mindset focused on awareness. Combined with a reliable anti-malware software, like Emsisoft Anti-Malware, a computer owned by a knowledgeable and aware computer user is pretty much impenetrable. …And even if nail polish won’t necessarily prevent physical intrusion, it will at least give your computer some much needed flair.